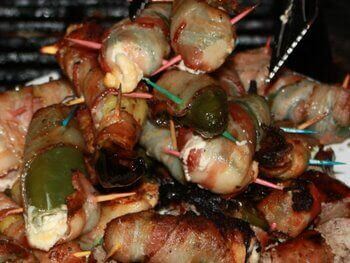 Cheese Stuffed Jalapenos: With Bacon! If you make one batch of these stuffed jalapenos, you'll be making them about every time you grill. People like 'em so much, they'll be begging you for more. The recipe for these grilled appetizers is pretty straightforward, but preparation requires a little effort. The work involved with removing the seed cores from the peppers, then stuffing the filling into them can be kind of tedious, but it's really worth the trouble. These things are good! Here's what you'll need to make a batch of these cheese stuffed, bacon wrapped appetizers. Cut the tops off of the peppers and remove the seed cores. I use a carrot peeler, which works really well. Combine the softened cream cheese, the smoked cheddar, salt and the garlic. 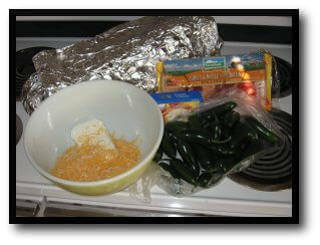 Using the handle end of a teaspoon (the kind you eat with), stuff the cheese into the peppers, filling them about level to the top. A half-slice of bacon is then doubled up and draped over the top of the pepper. Run a skewer through the peppers, securing the bacon. The bamboo skewer also holds the peppers upright as they grill, with each end placed on the side of a baking pan. Grill the stuffed jalapenos with indirect heat until the peppers have become soft, and the bacon is crispy. FYI- as the jalapenos soften they'll lose some of their heat.